UDM Downloads > VideoEdit Mobile Video Converter ActiveX! Convert video 3gp, flv flash video, ipod, psp, DIVX, AVI, WMV. Support MPEG4, H.263 3gp video with aac or amr audio. Allow Input MPEG2, QuickTime MOV, Mp4 with aac, 3gp with amr , MPEG1, VOB, WMV, AVI, ASF DIVX file. 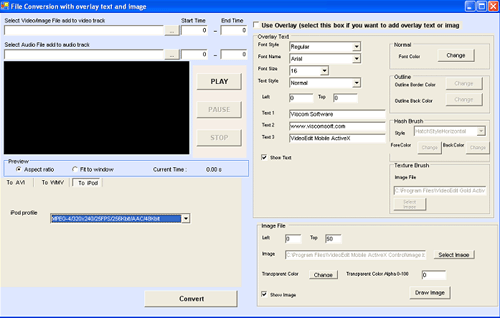 Draw Multi-line Text, Image at specific time on video, adjust transparent color, alpha value of Image. Preview Multi-line Text, Image before save to video. Add a 3D transitions (70 transitions) between any combination of video clips, pictures. Add an effects (over 50 effect) between any combination of video clips, picture. Extract part of video files to another video format. Export video frames to separate image files/memory(Picture Box, HBitmap) and resize to specific size. Export wave, MP3 file from media file and save to specific number of channel, sample rate, bit per sample. Support input vob file format. (need dvd decoder) Compatible with any programming language that supports ActiveX (Access, Visual C++ , Visual Basic , Visual Foxpro, Delphi, .Net, etc.) Include VB.Net, Access, Visual C++ , Visual Basic , Visual Foxpro, Delphi, .Net Sample Code. Royalty free distribution of the OCX file.